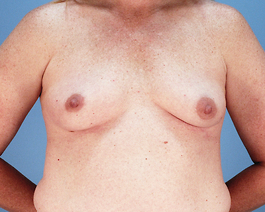 This patient from Virginia Beach, now in her mid-40’s, underwent breast augmentation 5 years ago. 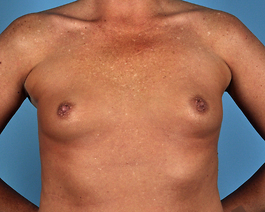 She had 420 cc saline implants placed beneath her muscle on both sides. Since then, she has gained a little weight and at this point in her life feels that her breasts are too large. She struggled with the decision to have smaller implants or have them removed completely, which can at times be a difficult decision. Therefore, we performed a deflation simply under local anesthesia to show her what smaller implants would look like before completely replacing them. 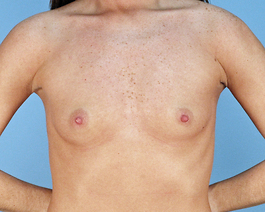 A small needle removed 200 cc from each implant, leaving her with 220 cc in each breast. 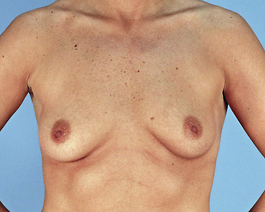 Feeling confident after actually seeing and feeling what 200 cc is like, she had both implants replaced with 225 cc saline implants and is extremely happy with the result and how comfortable she is.